WAIST HIGH: Happy 25th Birthday Youthquake. 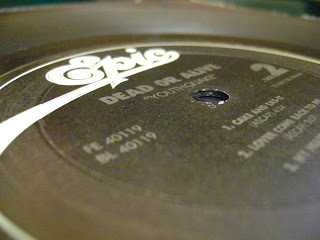 The second album by Dead or Alive, Youthquake was a commercial breakthrough for the Liverpool band. Success came as a result of "You Spin Me Round (Like a Record)" reaching #1 in the UK in March of 1985. The song then entered the US charts in September, going to #11. "You Spin Me Round (Like a Record)" has since been released three times, reaching #5 in the UK in 2006 after Pete Burns' appearance on UK Celebrity Big Brother. The other singles released from Youthquake were "Lover Come Back To Me", "In Too Deep," and "My Heart Goes Bang." This writer is especially fond of the eight minute long final track, "It's Been a Long Time." Youthquake gave the producing team of Mike Stock, Matt Aitken, and Pete Waterman, said to be the most successful writing and producing team of the 1980s in the UK, their first #1.